Are you bored with your current hairstyle? Are you a person who often keep a type of hairstyle without bangs? 1.1 What are clip-in bangs human hair extensions? 1.2 How to use clip in bangs human hair extension? 3.8 Side-swept wavy human hairstyle with bangs: – an elegant curl. 3.16 Curly natural hairstyle with bangs: emphasize your natural beauty. Bangs may be the thing which changes your face completely. However, a lot of girls are hesitant to get a bang because of many reasons: being afraid that it doesn’t match your face, losing a part of the hair, cutting doesn’t follow what you wish, etc. If you do it on your natural hair, you may love or regret the result. Clip in bangs is a perfect solution for you unless you’re ready to commit to having permanent bangs. What are clip-in bangs human hair extensions? 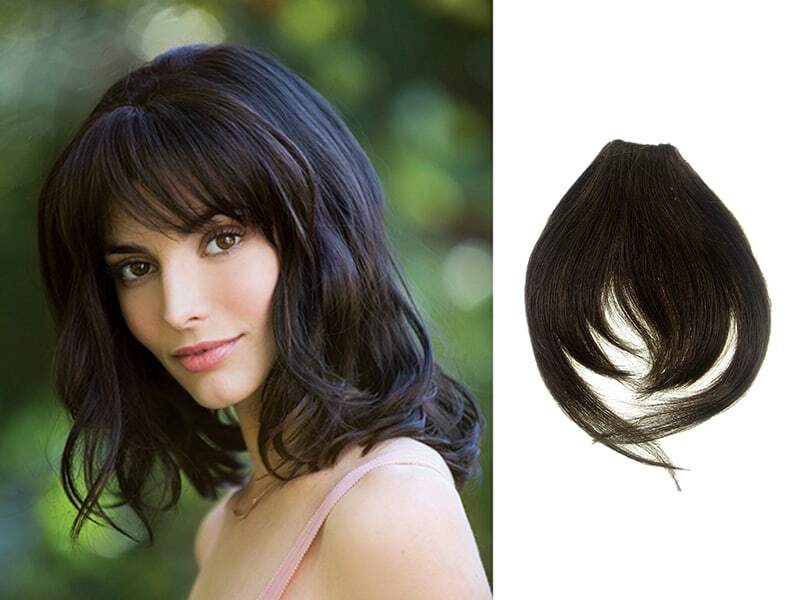 Clip in bangs human hair extensions is a type of clip-in bangs hair extension made of human hair. Bang is a fringe of hair cut straight across the forehead. The length of clip-in bangs human hair extension is longer than you imagine in order that you cut your hair extension following what you want. Bangs is one of the favorites and has never been old-fashioned. 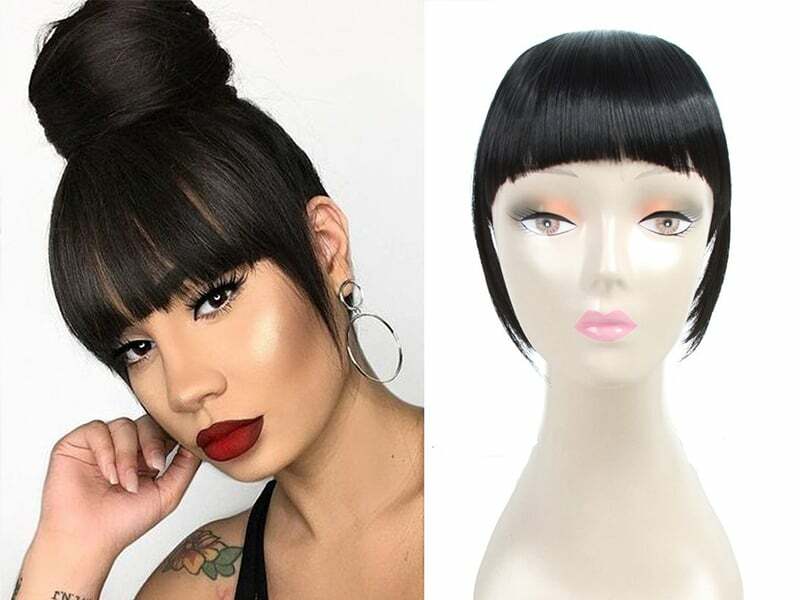 There are many ways to style a bang, you just have to find the most proper one for your face shape. Read more: How To Master Buy Hair in Bulk Skills in A Few Steps! The perfect bang can help you emphasize your good features such as your eyes or your cheekbones. The good thing about this hairstyle if you don’t have to do it immediately if you’re not ready for it. All you need to have in hand is a clip in bang which is perfect for changing your look anytime you want to. Wear it according to your mood and outfit! The clip in bangs hair extensions are made from high-quality human hair and will last a long time(about 2 years or more if you care for them thoroughly). There are available in multiple colors. Let’s choose color match your natural hair or a different color to create a unique hairstyle. No problem! Flexible & heat resistant: Can use heat tools up to 450 °F and curl it or flat iron it, cuticle-intact hair reverts to the natural texture after a quick wash. 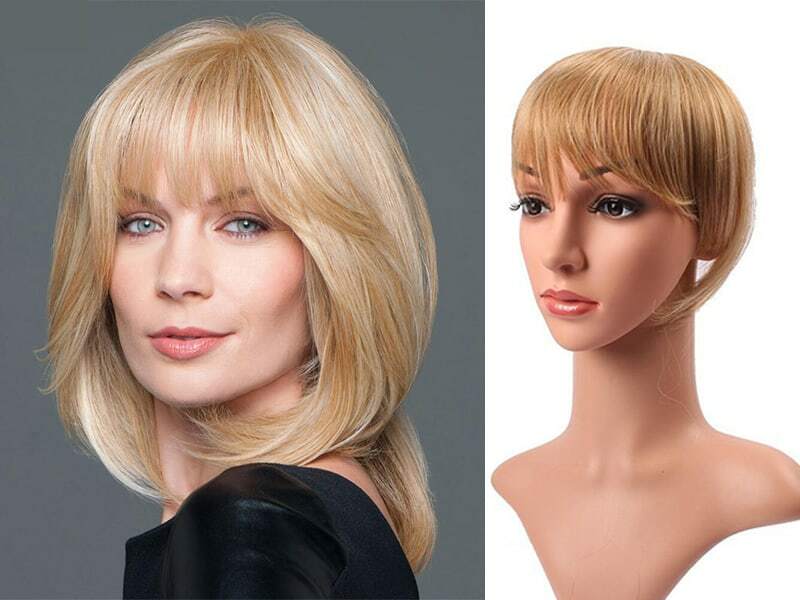 The clip-in bangs human hair extension come equipped with the side fringes ladies long for. They can be creatively cut to match your style. You can tuck them behind your ear or let them hang for a modern, chic look or if you are in sultry weather. How to use clip in bangs human hair extension? A bang extension is extremely easy to wear just like any other hair extensions. You only need to make sure to invest in a good quality one to get the best results. So as to have satisfying results, follow these simple steps on how to properly install and blend them with your natural hair. There are many color choices available, so you need to determine your current hair color. This is a key element in keeping your clip-in bang totally undetected. Remember to choose a product with good quality clips to ensure that there is no chance of it slipping off from your head. A brand new clip-in bangs extension from the package may look a bit shiny and has different texture compared to your natural strands of hair. It means that you must wash it firstly and condition, the night before you use it if possible. Doing this will remove the unnatural shine from the product to make it look more like your real hair. Apart from washing it, you may spray it with dry shampoo if you prefer doing this way because it takes less time compared to washing it. Split your hair at the center to keep your strands of hair out of the way as you attach the bangs extension or may tuck your hair at the back of your ear as well to keep it out of your face during the attachment. Plait a part of your hair and use it as a base to where you will attach the clip in bangs. Clip it underneath the plait and attach it tightly on your hair. Besides, make it a point to create the plait and attach it towards the top of your head as this will make the seam of the bangs hidden. Keep in mind to protect all the clips so that it stays in place no matter what you do during the day. Style it in a way that it blends perfectly with your real hair. You can cut the clip in fringe (even out its texture so that it matches with the rest of your bangs). Blow dry naturally and brush it any way you want to just to balance out everything. 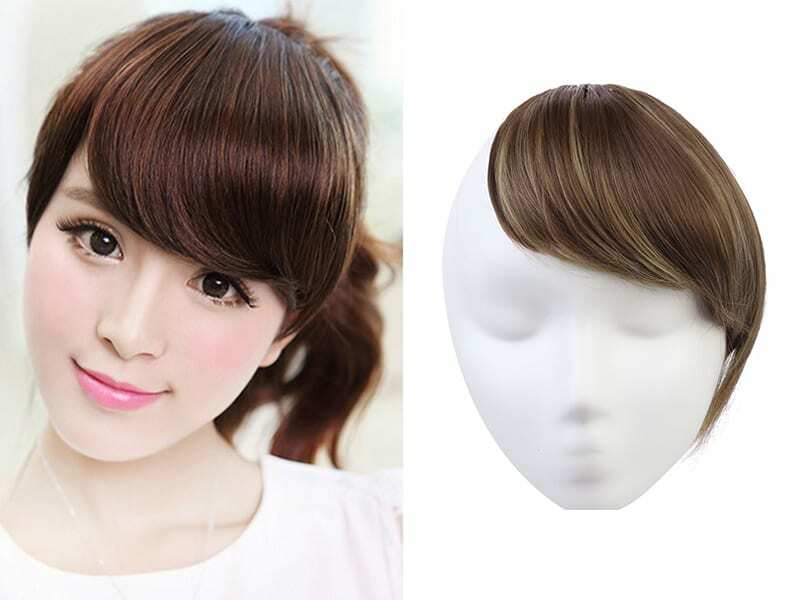 Clip in bangs human hair extension is really easy to apply and use in any case. It removes the concern about losing hair unwillingly of most women. It can change your daily look. Let’s try it on once! With a large number of customers from America, especially African American women, let me tell you about African America hairstyle today. And, you want to change a bit your daily hairstyle but you don’t want to go to a salon or lose your hair. Just simply change with your bangs and if clip-in bang can help you solve this problem. Let’s find out about clip in bangs for African American hair. Pick up a clip-in bang human hair extensions. You can get one at your local beauty store or order one online. You must choose the most proper one which blends your natural color hair and has a suitable length. Split your hair down the center. This moves your hair out of the way, so when you apply the clip in bang extension, it sits flat in opposition to your head. You can even push your real hair behind your ear while you apply it. Spray a little bit of dry shampoo on the clip-in bang. Synthetic hair can have a sheen to it that looks fake, so you should buy bangs hair extension made of high-quality human hair extensions. The dry shampoo takes away that unnatural shine and makes it look more like your hair if you need synthetic bang human hair extensions. Move the clip-in bang back toward the top of your head along your section. Go on moving it back until the ends of the bang line up where you want them to drop along with your brows. This will make it less noticeable when people look at you straight on since the seam of the bang extension won’t be as detectable. Tighten all three clips from the underside of the bang onto your natural hair so it stays in right position. The longer pieces along the sides of the bang help bang extension blend into your haircut perfectly. Brush the bang to match your style. In the next part of this post, I will recommend everyone clip-in bangs human hair extensions for African American hair with 18 different hairstyles. Hair Horoscope 2019: What Do Horoscopes Reveal About Your Perfect Hairstyle? It looks best on those with killing-me cheek-bones. The wispy bangs conceal a larger forehead while the medium length layers make your face become more graceful. It makes angular face softer shapes with its body and blunt cut ends. It is really suitable for a rounder, fuller face. The bangs create dimension within the face and accentuate your eyes and cheekbones. Optimize the thickness of your hair and look best for the angular face. The half-hawk means that the front of the hair is in the shape of a faux-hawk yet the back of the hair hangs loose. It makes you become luxurious and glamorous. As a cool spin on the traditional straight bob cut, adding a wavy texture creates a unique hairstyle. Side-swept wavy human hairstyle with bangs: – an elegant curl. Just need to use a wide-tooth comb through the curls to create uniformity, sweep the lock to one side and pin. It is suitable for the girls who have short hair. This hairstyle is very keen and it’s a great choice to hair for those who relax their head skin and natural hair. Is great on the red carpet with a ball gown or simply on a casual event, at the office or on a date. The best selection for mature women who want to look chic yet not overly kiddish. Better with long and straight hair; match with bright makeup. Really adorable if you have high cheekbones or beautiful eyes. Curly natural hairstyle with bangs: emphasize your natural beauty. The curls are owned by African American women. The long curls in the front frame the face so that it is not completely open. In the meantime, the updo in the back helps to cut down on unnecessary hair. It shows that the wearer of the cut likes to add their own mix to things while displaying some harmony with modern trends! Have you chosen yourself a suitable one? African American can create many different hairstyles with their bangs. Of course, they can create with clip in bangs human hair extensions for African American hair. What about you? It is extremely easy to find the clip in bangs for African American hair at an online shop or local hairdressing shop.